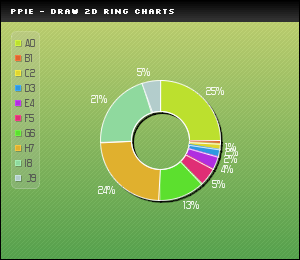 This function allows you to draw a 2D ring chart. All the drawing parameters are given trough a $Format array. To learn more about this please read the Format array guide. You can specify if the outer radius of the pie chart with OuterRadius. You can specify if the inner radius of the pie chart with InnerRadius. You can draw a border around the pie parts setting Border to TRUE. You can set the border color with BorderR,BorderG,BorderB. You can write the data labels setting DrawLabels to TRUE. The labels colors can be set with LabelR,LabelG,LabelB,LabelAlpha. PIE_LABEL_COLOR_AUTO to re-use the color of the data series. You can write the data values setting WriteValues to TRUE or to PIE_VALUE_PERCENTAGE if you want to display the computed percentages. You can specify the values color with ValueR,ValueG,ValueB,ValueAlpha. You can specify the values sufix with ValueSuffix. You can specify the padding for the values with ValuePadding. You can define the number of decimals in the percentages with Precision. 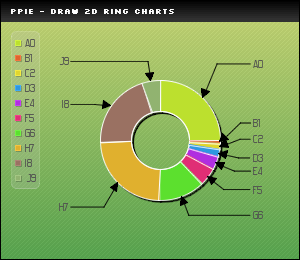 PIE_VALUE_INSIDE to write the values inside the pie chart. PIE_VALUE_OUTSIDE to write the values outside of the pie chart.